I'm thinking of buying a march pump because all my setup is in the basement, but I boil up a flight of stairs in my garage. I plan on transfering liquids both ways. I read that the pump should be near the vessel one is pumping out of, so that would mean I have to move the pump from basement to garage and visa versa. Some basic questions: Would I be better off getting the pump with a plug or one that I wire? I have to pump about 16 feet, 5 of which is up hill. Can the pump handle that? The pump has to be primed. What does one actually do to prime the pump? Is it a hassle? And, do I have to prime it each time I start the pump? Thanks for any advice. It has to be a couple feet lower than the kettle to self-prime. Other than that it will pump the 5ft of head and that distance. Get the new high volume one to assure this. I bought one with a plug just because I didn't want to bother with wiring. I purchased mine a few weeks ago, went with Morebeer for the best price. If the head conditions are a concern, then getting the 815 pump is recommended. If this situation only has a total of 5' elevation change, then the 809HS pump should be OK. If you are going to have a switched pump, you may prefer the non-plug version. If the distance from the receptacle to the pump location is large, then the non-plug version will enable you to get the right amount of cord for the installation. Seems like a lot of people are buying the 815 for the ease of priming. In fact people are upgrading their 809's with the 815 impeller. I upgraded. Its a much stronger pump now. It was worth the cost of the new impeller. Martin, how much was the impeller and where did you get it? I don't remember which place I purchased my 815 impeller, but a Google search turns up plenty of resources including Northern Brewer, $24. I suggest that folks get a replacement o-ring and a couple teflon thrust washers when ordering an impellor since those items are cheap and don't add to the shipping cost. Bad news for Northern Brewer is that they don't seem to carry the teflon washers, but they do carry the o-ring. Theres a kit on ebay that includes an o-ring and thrust washer. Thanks, guys. I'm not having any issues with my pump, but for that price I might upgrade anyway. 815 is the way to go in your situation. At 5' elevation change, you're at the end of the performance curve, so you'll just get a trickle at a time with 809. 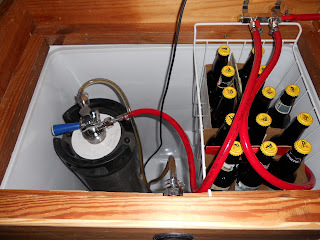 I would also suggest a case for the pump, similar to the pump toolbox project in BYO. You'll be carrying that thing all over the place, so a protective cover and convenient on/off switch will be a blessing! Rebel Brewer had the best price when I upgraded mine. Does a lot better now. Fewer problems with air pockets and losing prime. My brother and I upgraded the impeller, well worth the price (which was cheap, like $25 (my brother ordered it, not sure where either). I was considering getting another pump (nano pump $400, ouch!) before this "fix"....huge improvement to force wort through my system's HERMS coil.